Come on in 2015 - we've been waiting for you! I thought about a negative title for this post as 2014 has, in general, been a horrible year. Speaking to others, many have also said it was a bad year in so many different ways, so we're not alone. But that's not how we're feeling, so instead we're looking ahead to good times, not back to difficult times. But a quick retrospective is called for, to look back before turning and moving forward. By far the worst event was losing Cathy's Mum - Flo - in March. Although 90 years young, her loss was still sudden and hard. RIP Flo as you and Ted dance the night's away. Our son Chris also had a rubbish year, having suffered a serious leg injury which didn't respond to treatment, he was invalided from the Army in July and now has to start again to find work - better luck next year son. We both suffered from ill health this year; Cathy with fibromylgia although she refuses to let it stop her keeping active and me with sinus problems, which an operation in October has hopefully resolved. Others close to us have also suffered ill health and we hope we can in some way help them get well, with humour and friendship. And then there's been the ongoing saga of our van conversion. Ripped off by a cheating conman, the legal case continues. Although we don't expect to get any money back, at least we can try to put him out of business and hopefully prevent him killing someone with his dangerous work. The year wasn't all bad though. 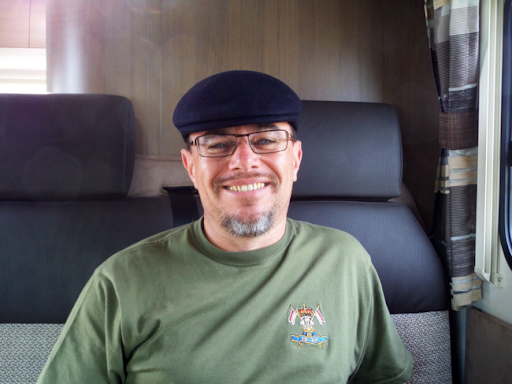 We managed to enjoy a couple of trips away, albeit in a hired motorhome (thanks to Dave & Lesley at Live the Dream Motorhome Hire). In July my cycling buddy Ray and I camped out in Yorkshire to watch the first two stages of the Tour de France and ride some of Stage 1 - great times. Later that month Cathy and I had a week on the Llyn Peninsular in North Wales, much like Cornwall only quieter; it's an area we'll definitely return to. In August we had a great weekend away at the Rewind Festival with our great friends, Steph and Ian. 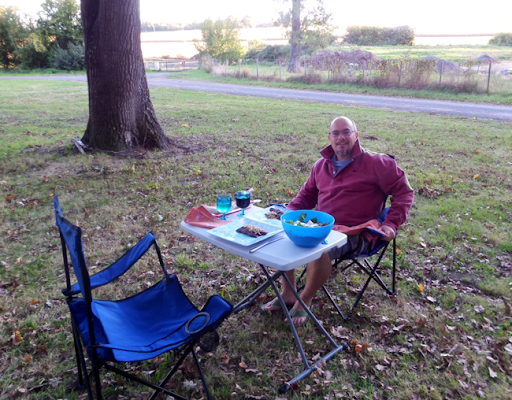 And in October our (thrice delayed) 'summer' holiday was spent in Northern France and the Loire Valley - hopefully a taste of things to come. So what will bring 2015 bring? Well, first of all we wish for good health for ourselves, our family and our friends; as we get older keeping fit and well is all the more important. We hope both our children (and their partners) will enjoy luck and good fortune on their chosen paths. For us, we wait with baited breath for the arrival our campervan, already christened "El Nido" and are finally starting to actually believe he'll be ready soon and we can get out and about at weekends and holidays. 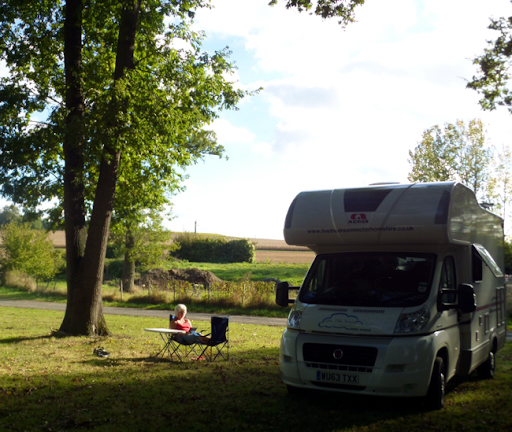 Next year we're talking about taking our main holiday exploring the Moselle Valley in Germany, with perhaps a week in Norfolk, plus lots of weekends away in the van. And we both continue to learn new languages; I struggle through French as Cathy makes great progress with French, Spanish, German and some Italian and she's just downloaded Greek too! Next year will be the start of our longer journey as we prepare to make the leap in a few years' time into stopping full-time work and living a simpler but more fulfilling and enjoyable life - more sunshine, swimming, reading and relaxing (oh and the odd bike ride or three for me!). For me, this seems all the more scary - I've worked full-time since the day I finished my last O Level in 1979 and giving up a secure and well paid job is a bit like standing on top of a very high diving board and willing myself to jump! 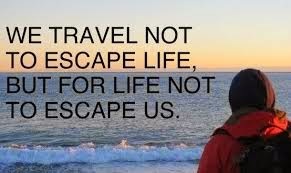 But I'm sure once we get to it we'll adapt to our lower income and enjoy the freedom of travelling where we want, when we want. So, we'll not be sad to see the back of 2014 and look forward to a much better year in 2015. Happy New Year to all our family and friends and we hope it brings you good times. The last day was the same as usual. Up very early, tunnel crossing, long haul up the motorway, unpack the van at home , drive it down to the unit to clean it (it was going out later that day we found out on our drive back up) and home to sort everything out, ready for work to tomorrow. We really needed this holiday; it should have been in the summer, but with all the hassle and stress with our van conversion, we've had to delay it twice. Normally it takes us 3 or 4 days to relax into holiday mode but this time it took about 10 days, indicative of the stress we've both been under this year, perhaps without realising it. But, still, we had a lovely time. It was a mixture of weather, early wind and rain and then the odd night or day of rain. But also lots of unseasonally warm sunshine; in fact last night was so warm we had the roof lights open all night, unheard of in the past. Next year we've talked about carrying straight on when leaving the tunnel in Calais, perhaps explore some of Belgium and Germany. It'll be good to see some other countries and get to know how they treat and accept (or not) campervans. Travelling in our own van is definitely something we still want to do and it'll be good when we can finally load him up and get away for a few small trips, adapting to the storage and living space and making him our own. Renting vans is like renting a house - it achieves the aim but it's not until you have your own and can put your stamp on it do you realise how much better it can be. A good night's sleep and I was up at 0900 for our baguette and croissant. It was another warm, sunny day. Our transit was only 1.5 hours today, so we set off just after 1030 and, after stopping for diesel (Crazy Frog style! 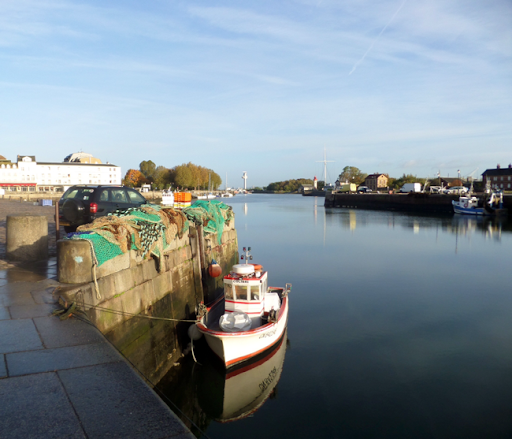 ), arrived at the Aire at Wissant just after midday. 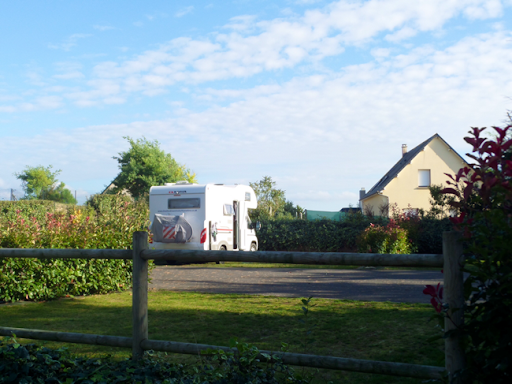 It was already quite full with only 2 or 3 spaces left and we managed to park up beside a British Burstner coach-built. 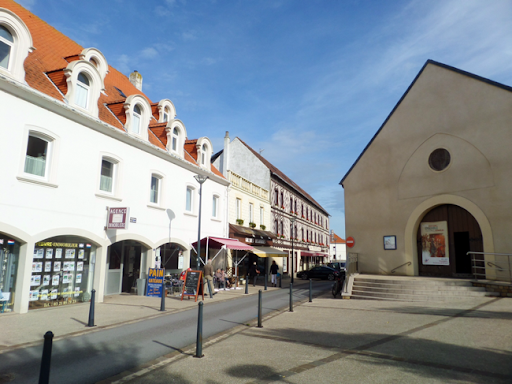 We took the footpath from the Aire and walked through the small, quiet streets down into the village square. 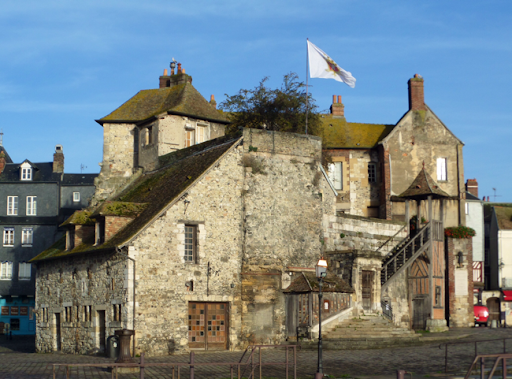 Wissant is a lovely little village, with a small church in the square, several small hotels and some great little bistros, brasseries and cafés. We stopped off at Chez Nicole for a beer; I'd read this place does great Moules and it was really popular, with most of the tables inside taken up by locals - always a good sign. We followed the road down towards the beach and popped into a clothes shop. Cathy bought some short blue wellies to keep in Nido and I bought a polo shirt and jumper, both very much in the style of Fat Face clothing. We returned to the van, packed a small picnic with the remaining stuff in the fridge, grabbed our chairs and walked down to the beach. 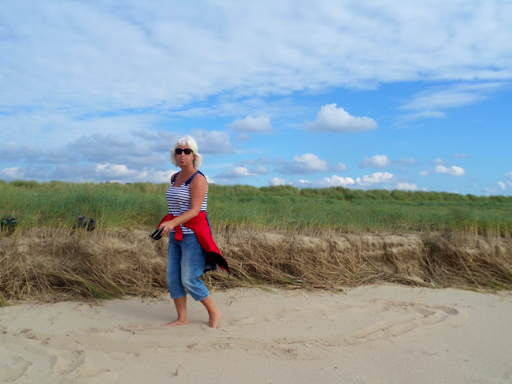 The sand is lovely and soft here and the beach very long and wide, albeit a bit windswept. We could see the white cliffs of England quite clearly and lots of families were out enjoying the very warm sunshine. We sat in shorts & t-shirts with our picnic and feeling the sun and wind on our faces. Cathy had a read while I walked down to the sea, which was warm and fine for swimming - shame I left my trunks in the van! Cathy then wandered off for a walk while I just shut my eyes to soak up the last of the sun and listen to the sea - very relaxing. I walked up from the beach to buy us both a salted caramel ice cream, which I (almost) managed not to spill on me by the time I returned to Cathy. We were both ready for a cup of tea by then so walked back to the van. There are some lovely little cottages in Wissant, many of them holiday lets. It's difficult to imagine we're just 14 minutes drive from the Channel Tunnel. Back at the van a small conversion pulled up with a man driving, he went round a couple of times but by then all the bigger spaces were taken, so we offered to move over a little so he could squeeze in next to us. He was an interesting chap. A thatcher by trade he'd done a few jobs in France and was travelling down to see an old lady aged 98, an ex-customer. She had a painting she wanted him to have, one painted by his thatcher friend who was now dead. He came from Yaxley near Peterborough and had done a couple of thatching jobs in the Hemingfords - small world. Our faces were glowing from the day's and sun and so after a shower and change, we walked back into the village to Chez Nicole for some Moules Frîtes. We sat outside to start and ordered a drink, listening to some demented monk hanging off the church bell, but with food not starting until 1930, we moved to an inside table. 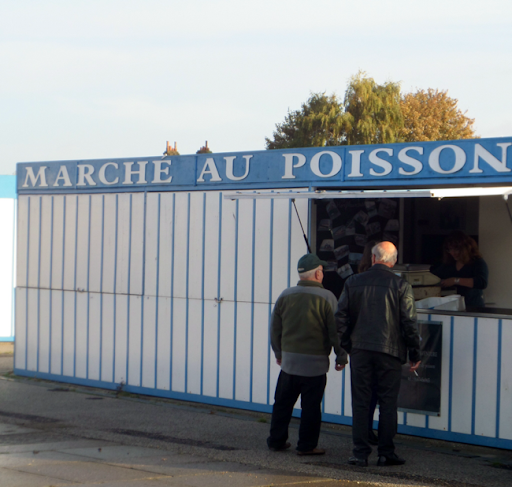 This place had just two items on the menu - Moules frîtes and Jambon frîtes. But it was clear it was very popular as many of the tables were already taken half an hour before food started. 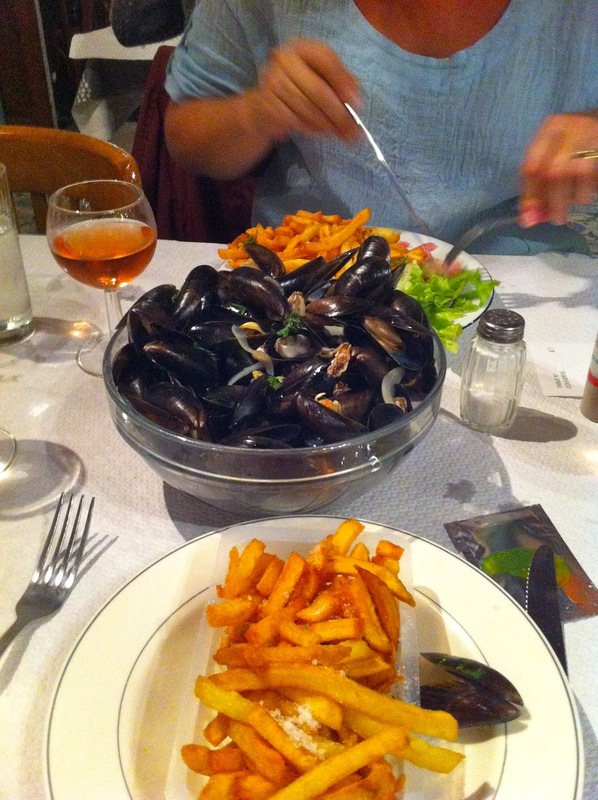 We gave our order - Cathy had the ham and me the mussels - and also a pichet of rosé. Pretty much everything except the food bowls, glasses and cutlery was plastic, but the service was fast and the food plentiful. My mussels came in a huge plastic bowl and Cathy's ham was hidden under a large pile of homemade chips with salad. Both were delicious and filling. The food and buzz in this very basic café was great. It was still warm when we paid up and walked back through the quiet, narrow streets. The stars were out and it felt like the best of British summer evenings rather than a night that was closer to November than September. It's been a lovely last day. Back at the van Cathy went to bed to read while I had a cup of tea and wrote up the blog. The alarm's set for 0600 - my normal time on a work day - and we'll be up and ready for our long journey North. True to form it rained in the early part of the night but was warm and sunny when I woke, quite late, at about 0915. 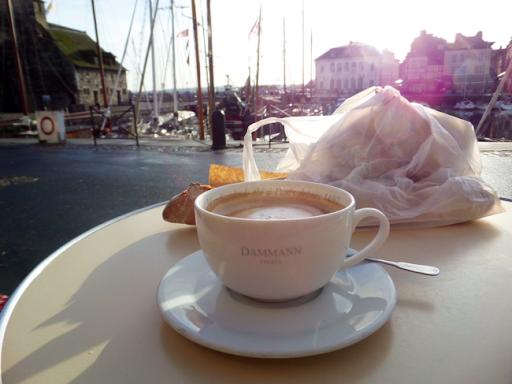 Up and dressed, I walked over to the Harbourside, looking for a Boulangerie and found one open down a side street. I bought 4 croissants, a small baguette for lunch and some local 'biscuits', similar to choux pastry, with large sugar crystals on top. 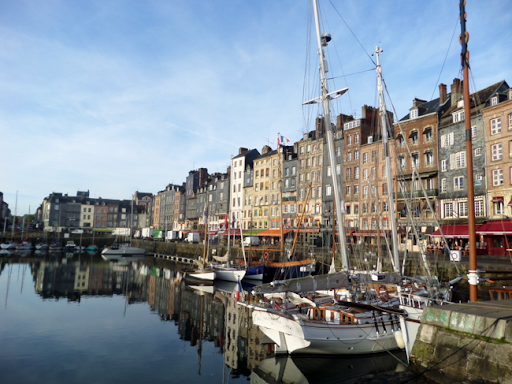 Breakfast sorted, I walked down to the old basin and sat outside L'Albatross café in the sunshine and ordered un grand créme. This was the most expensive coffee all holiday and I was clearly paying for the view, not the coffee, which was rather weak. 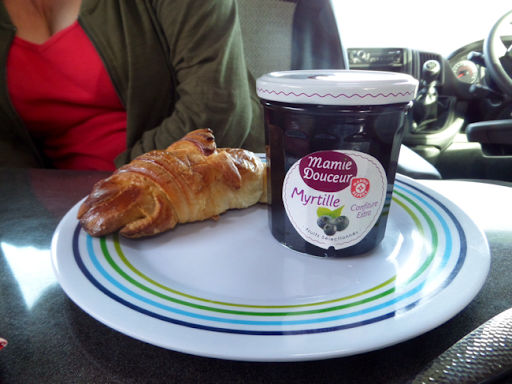 Back at the van the kettle was on and we had our croissants with bilberry jam. There was a small van next to us owned by a British couple. They had been down to Belgrade and had travelled up through Montenegro and Croatia and were catching the Le Havre ferry later today. Their next stop was Anglesey so we told them about some wild camping spots, as well as some good Aires and campsite books in Europe. Once we'd washed and cleared up we walked in to town to wander around the narrow streets and shops and buy some Christmas presents if anything caught our eye. We bought a few things, including a new cap for me; the shop owner went to great pains to 'fit' and adjust the tilt of the cap until he was happy it fitted properly! Cathy packed away our purchases carefully and we had a quick lunch before preparing to move. 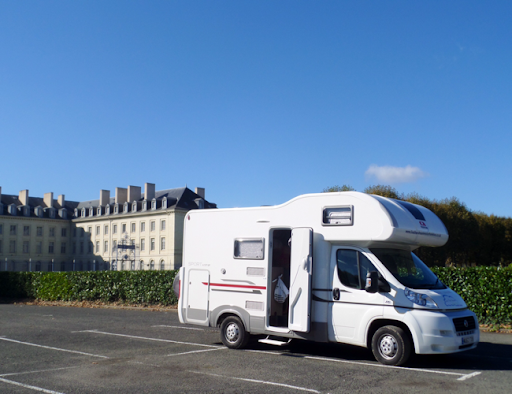 Fresh water refilled, EHU cable stowed away and waste emptied, we drove off for our 3.5 hour drive to the Aire at Fort Mahon Plage. On the way, driving through a small village, I spotted some rosemary growing alongside the narrow road, so slowed down, lent out and grabbed some for our lamb chops later that day! On arrival there were quite a few vans, all French. 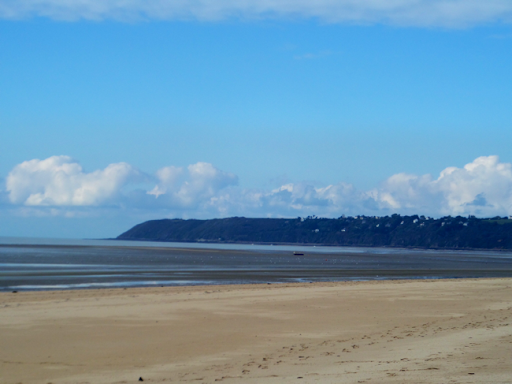 The Aire backs on to sand dunes and is only a short walk from the beach, which is very long and wide with soft sand. But the seafront (and in fact the road leading to it) is marred by ugly concrete apartments, fast food joints and grockles shops. 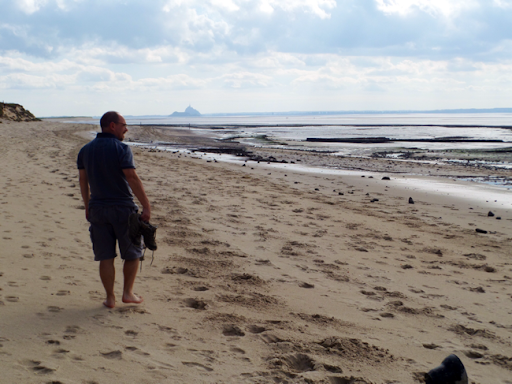 I described it as like Talacre Bay but without the scousers. 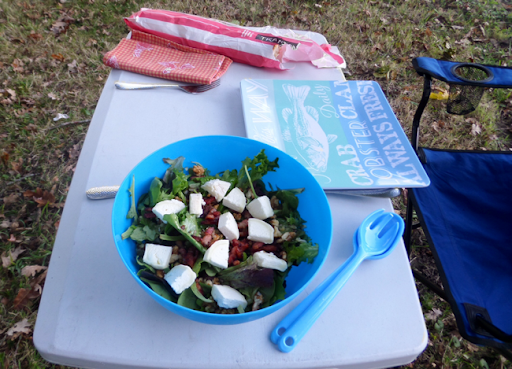 We had a walk along the beach and returned to the van, where I lit the bucket BBQ, while Cathy prepared the salad. Lamb chops cooked, we sat inside eating and listening to a Radio 4 podcast. 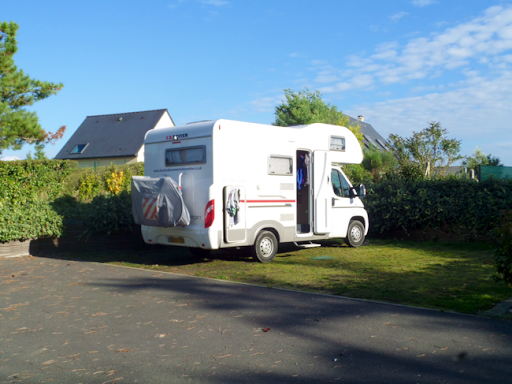 So a quite evening and early night, hoping for a good night's sleep and perhaps an earlier start to get a pitch at Wissant - our first stop in France 10 days ago - on what will be our last day and night in a France this trip. It rained hard in the night but it was dry and bright come morning and quite warm. I walked down towards the sea and into the village and bought us a banette. The gas played up last night and the fridge alarm woke me at 0210 (after years in the Navy my hearing's tuned for alarms) so I switched it off. 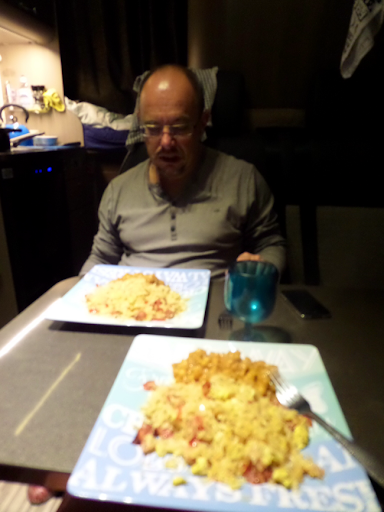 Back at the van Cathy was up and I boiled a couple of eggs each. We took the opportunity to have a good scrub out inside of the van - everything out, shaken outside, floors brushed and cleaned, including the cabin. We and the van felt much better for it although the outside is very dirty. I removed the fridge filters and gave them a bit of a brush and a good talking to. That seemed to do the trick as when I switched the fridge on to gas and cancelled the alarm, this time it stayed on. Breakfast done and everything stowed we hit the road. Our first stop was Pointe de Hoc. 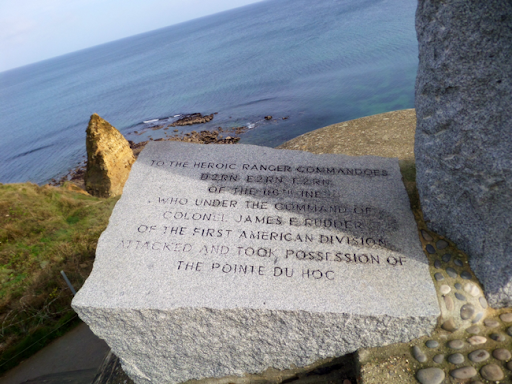 On D-Day on 6 June 1944 US Rangers landed on the beach and scaled the cliffs, using rocket propelled grappling hooks and ropes. This was strategically important as the German artillery based there could bombard the allied ships off the coast, but could also be turned east and west to bomb Utah and Omaha beaches. 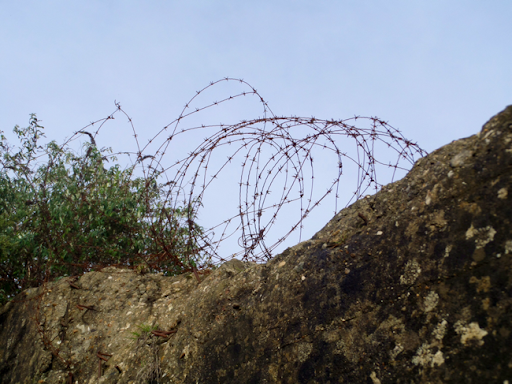 This position was therefore heavily defended and it's incredibly humbling to note that, despite terrible losses (nearly half the 225 rangers were killed or injured in that short assault), the first Ranger was on top of the cliff within 5 minutes of the landing and the position was taken 15 minutes later. 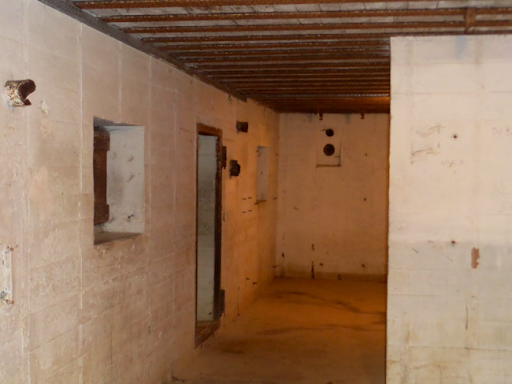 On arrival at the top they found the artillery pieces had been moved but some Rangers found them hidden behind a hedgerow near a wall and disabled them with thermite grenades. 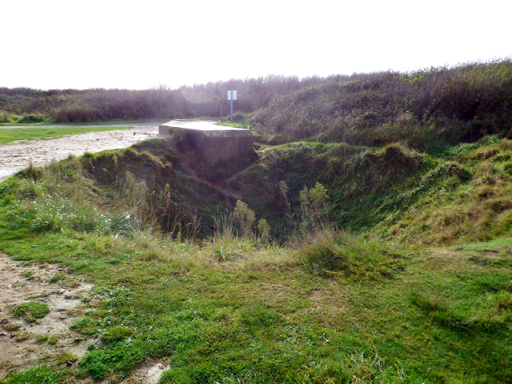 As we walked around, looking down into the huge shell holes and wandered inside the reinforced bunkers, some now a twisted mess of concrete and metal, it was difficult to understand how it would have been just over 70 years ago. Moving along the coast we stopped at Port en Bessin. 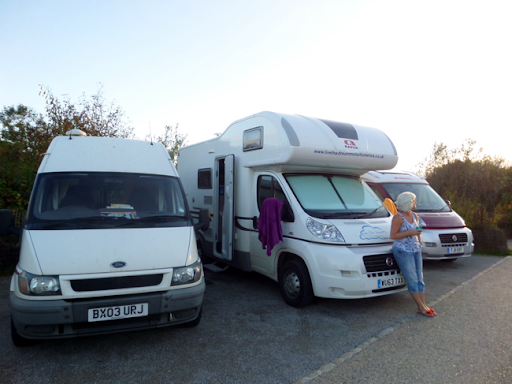 There was a good motorhome parking area - only €3.50 per night but no services (but they were just down the road at the Super U). This is a working fishing port and was a bit touristy. 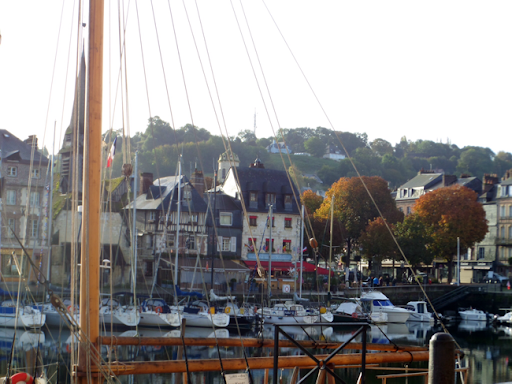 We carried on to Arromanche, parked above the town and walked down to the waterfront. 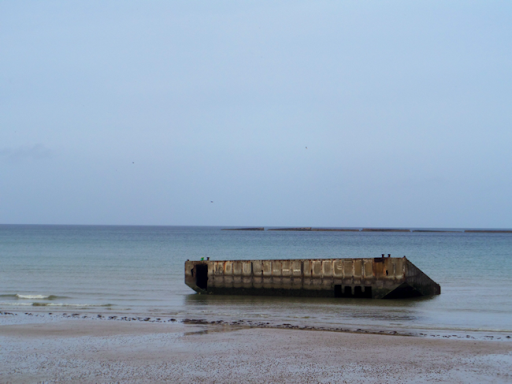 I wanted to see the remains of the Mulberry Harbour, built in secrecy in England then sunk to prevent them being spotted by German spy planes. They were then towed across the channel, refloated and used to disembark thousands of tons of equipment and troops; at the time it was the biggest man-made harbour in the world. It also has the D-Day Disembarkation museum on the waterfront, so has many tourist restaurants and shops to support all the visitors. As we walked down a group of French of teenagers walked past and a young girl asked us (in French) if she may ask a question and where could they buy a kebab! Very formal and polite and again we were taken for French people - I think it's because I look a lot like Sacha Distel Cathy like the bed-ridden mother-in-law in 'Allo 'Allo. 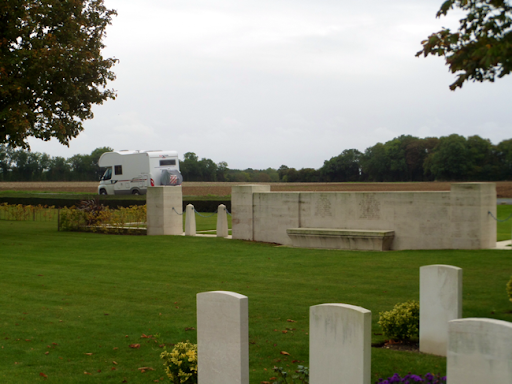 We stopped off at the Commonwealth War Cemetery just outside Ryes in the village of Bazenville. It was poorly signposted so difficult to find. 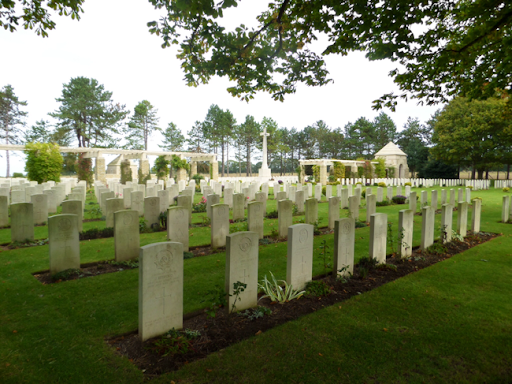 This cemetery has 630 British graves, plus some Canadian and Polish. 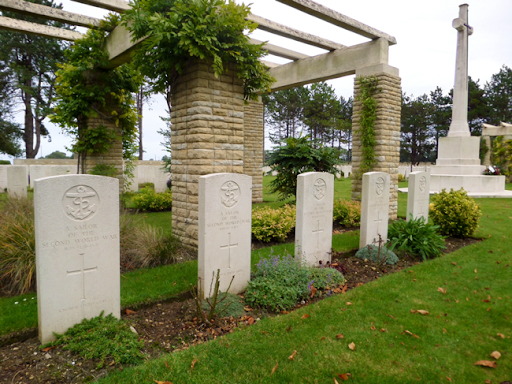 It also had a large number of German graves. 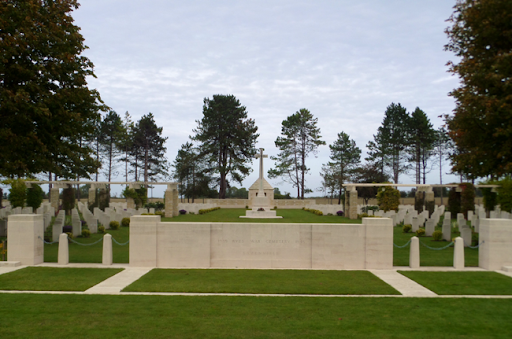 The British graves were personalised with family notes engraved on the bottom, giving a stronger personal feel to those who laid beneath our feet. 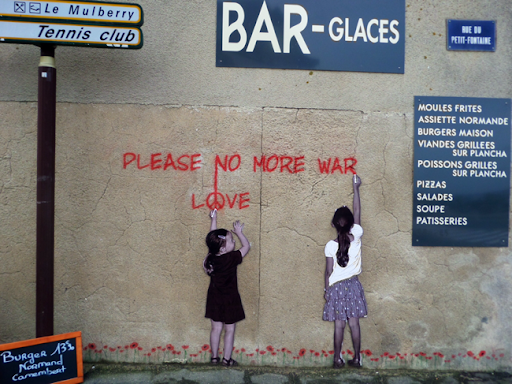 The average age was about 22 and most were killed between D-Day and the end of September 1944. There were also a large number of Royal Navy sailors buried here, 'Known only unto God'. 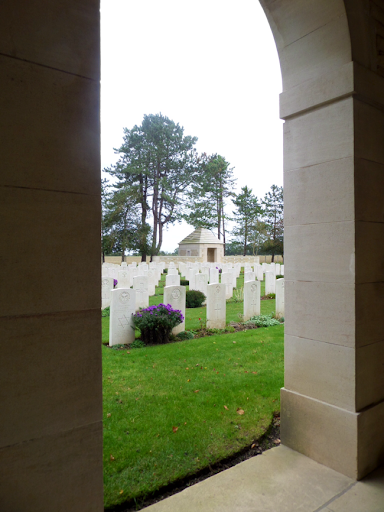 As with all these cemeteries, it was immaculately kept, peaceful and a sombre reminder of the futility of war. I signed the visitors book and, as we slowly walked back to the van I stopped, turned and saluted these brave men. 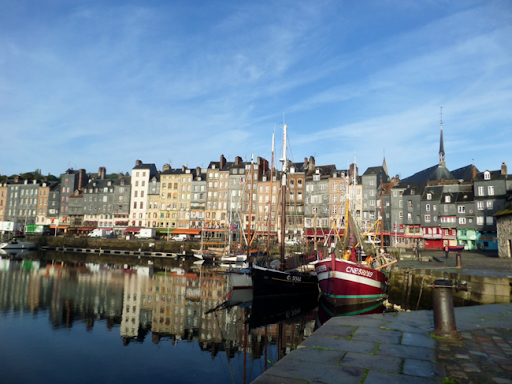 So it was onwards to our overnight stop in Honfleur. This is a large Aire and comes with electricity and water, so we made the most of both - we now smell nice and clean! Parking payment is via a meter and the water and electricity is 'free' - ie no additional code or payment required - so worth noting in the future for free fresh water top up. We finally had our meal out in a small restaurant off the Main Street. It was quiet, just another English couple and a very drunk old French man sat in the corner, who mumbled, sneezed and farted through his meal! We found out his name was Didier and he had a little dance in his chair later on! Cathy had hot spicy crab to start and I had foie gras. For main Cathy had duck with a foie gras sauce. I had Marmite Pecheur, a pot of mussels, clams, whelks, prawns, langoustines and various kinds of fish in a light creamy sauce. I had some taste today and it was delicious. Having said that, the chef came out after service and looked like a toothless, dirty crack-head - had we seen him first we might have moved on! It started to spit with rain as we walked back and rained hard later as we sat in our comfy clothes, watching '12 Years a Slave' on the Mac, via the Passport HDD that Nicola bought her Mum for her birthday. This was a late night for us, normally we're in bed by 2100, but we enjoyed watching the film in the warm and dry of the van while it tipped it down outside. The morning was still but cloudy. I was up around 0800 and walked down to the Boulangerie to buy some breakfast but, like everything else, it was shut! So breakfast was a poor affair - coffee and a small orange for me and tea and the remainder of her egg-custard for Cathy. As we emptied waste and took on more fresh water it started to spit and that set the weather for the day - still and cloudy, interspersed with periods of light and heavy rain. We needed some food so I drove towards Granville and the large Le Clerc supermarket. Just before we got there I spotted a 'Mr Bricolage' - these are large DIY stores and we'd being looking for a 'Ned' to help us fill up with water without a hose. What's a Ned? 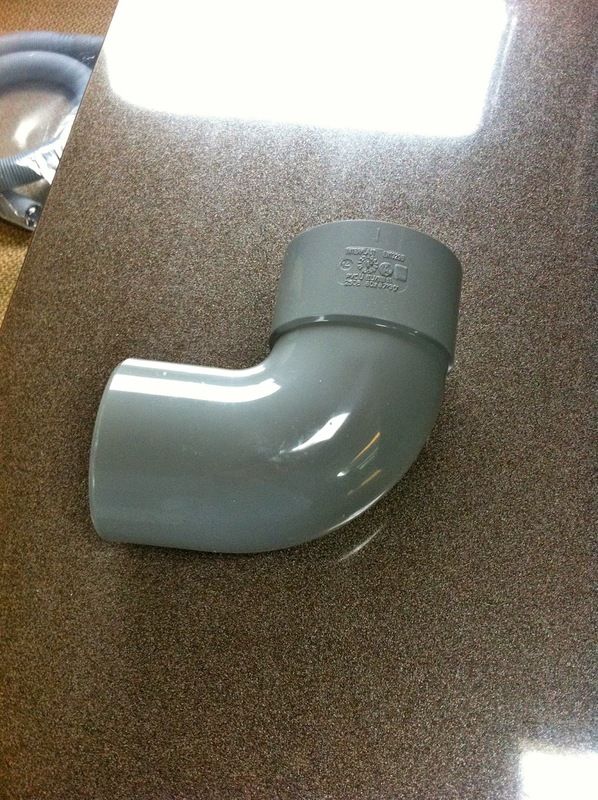 It's what Steph & Ian call their plastic drainpipe u-bend. It fits perfectly into the water filling hole and makes it easier to fill up from a water container or watering can, doing away with the need to use a hose all the time. It's called 'Ned' because it's bright orange so reminds them of the colours of the Nederlands! I managed to find something similar, only in a grey colour similar to our van, Nido. So ours has been christened 'Nid'! I also bought some flexi hose to make filling containers from a tap easier, a small mat for our van's floor and some 'noise short' martial to reduce rattles when driving. 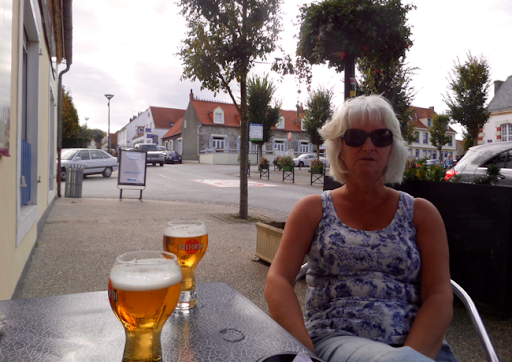 Mr B shopping done, we drove to Le Clerc to fill up with food and water, the drove to Coudeville sur Mer to eat lunch with a sea view. On arrival Cathy prepared the food and I switched the fridge from battery to gas power, to be greeted by an audible alarm, which meant the gas bottle was empty. But that's OK, we have another full one. I went out, disconnected the empty one and shuffled them over so I could connect the new one. But I just couldn't get it on. I managed a few turns before it became so tight I couldn't make any more turns by hand. Twenty minutes later Cathy told me to come in for lunch and try after, which I did but with the same result. I then spotted the full bottle had a dent in the top which meant it wasn't completely round, hence the problem. I managed a few more turns but could get no further by hand. The thought of another 5 days without gas was too much - no hot water for showering or washing up, no hot drinks, no fridge; I wasn't going to let the 2014 gremlins this time! Gas bottles in France have different fittings to the UK so I couldn't just go and buy another. It's this sort of thing the EU should be sorting out - standardised fittings across the EU, not straight cucumbers! My last chance was to try and get it screwed on with some mechanical help, so it was back to Mr Bricolage to buy some mole grips. I tackled it again in their car park and it seems to have worked - we have gas again! The plan was to stay on the Aire in Granville tonight, but as we drove into the large town, the satnav took us down ever smaller, tighter roads. In the end we decided to go somewhere quieter, so drove back out to have a cup of tea (now we have gas!) and think of where to go next. 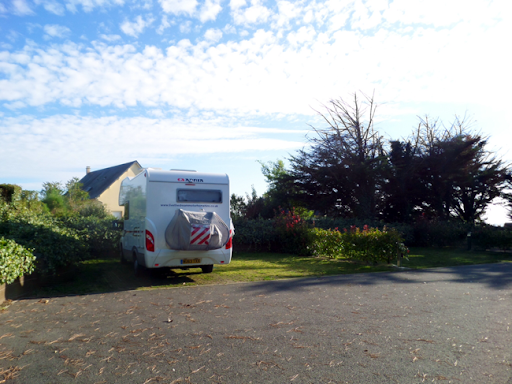 We parked by the beach just outside Jullouville, had our tea and sat looking out to sea. 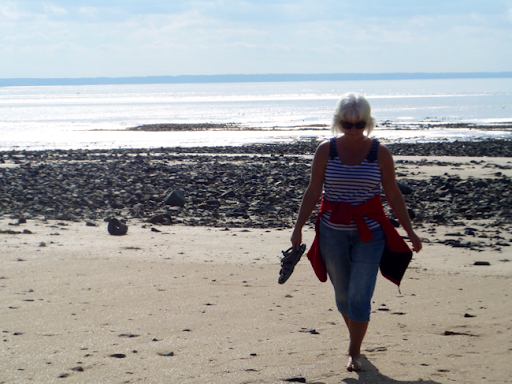 Cathy went for a walk on the beach to collect stones for the garden and I followed. On our way back it started to rain heavily and we were both soaked when we got back to the van, but we enjoyed the walk! Thinking about where to go next, we decided to head up towards the D-Day beaches, then start heading east towards Calais. When Cathy woke up I checked the restaurant was open and could see people sat in there, so we got ready and walked over to find, in those 15 minutes, all the lights were off and it was 'F*****G SHUT!! The gremlins were once again kicking us when down. 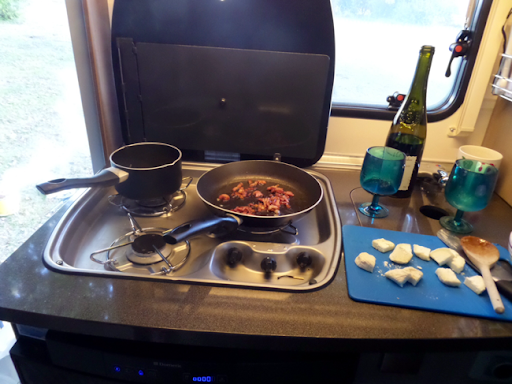 I really didn't want to cook in the van again, particularly with it raining - it's harder when we can't have the door and skylights open. So we decided to head off to find something to eat. By now it was dark and still raining so finding an open restaurant would be hard. So,we ended up eating crap at MacDonalds :-( The only positive side was they thought I was eating in so gave all the food on a tray - we now have a McD's tray for Nido! 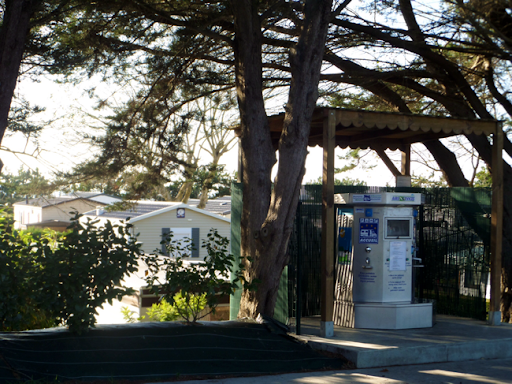 Back on the road, I keyed in the coordinates for an Aire at Grandcamp Maisy, on the coast and part of 'Utah' beach. It was thankfully only 20 minutes' drive and we pulled into a hedged pitch with about 5 vans already there - the most we've seen on any Aire this trip. We finished the day with a cup of tea and some patisserie. We have a few damp coats and clothes slowly drying out in the van, but at least we're warm and dry. 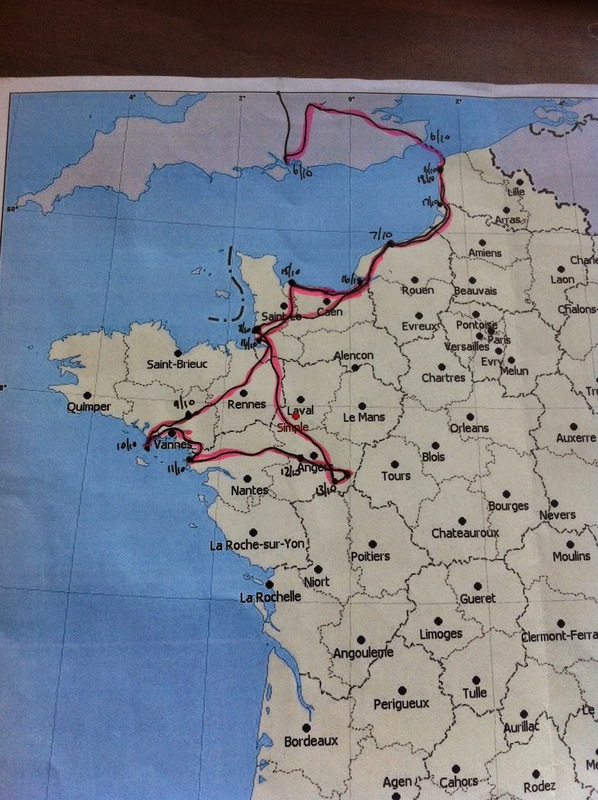 Tomorrow we'll follow the coast road east, stopping off at war cemeteries and museums. And tomorrow we are definitely staying in a town where we can get something to eat, Rural France is most definitely closed in October! It was quite chilly in the night and very quiet, although we heard owls as we drifted off to sleep and Cathy says she heard the hunt in the local fields early in the morning. We woke to cool, clear skies with a lovely autumnal mist. As we packed up the sun shone through the misty trees - it looked lovely. There was a free fresh water tap, so we topped up our tank and spare bottles and drove off. We'd decided to return to the coast for our last few days. 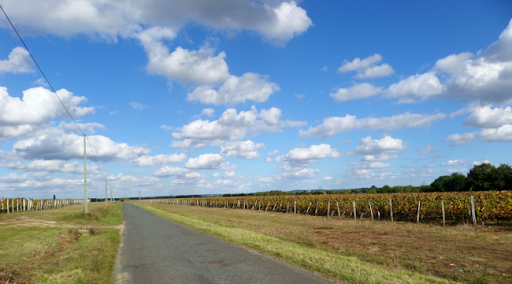 The Loire countryside is lovely and we passed lots of vineyards and local wine producers. We pulled off the main road on the way into a small village where I bought a baguette and a slice of egg custard for Cathy. We found a large parking spot between a farm and a forest of sweet chestnut trees and joined the French workmen who had pulled over for the compulsory long lunch 'hour'. 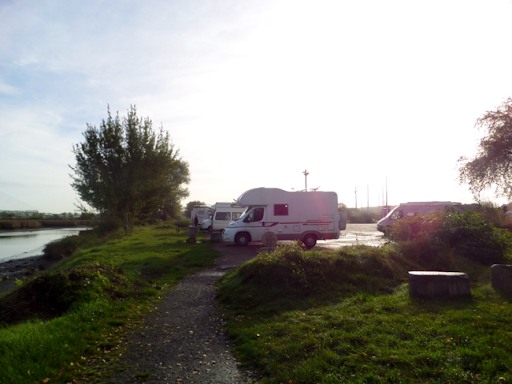 Fed and watered, we carried on and arrived at the Aire in St Jean Le Thomas at about 1430. We visited here a few days back to fill up with water and liked the spot. 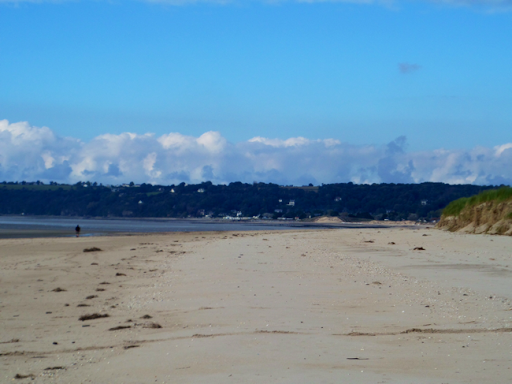 We had the Aire all to ourselves, which sat above the municipal campsite, which itself is right on the beach. 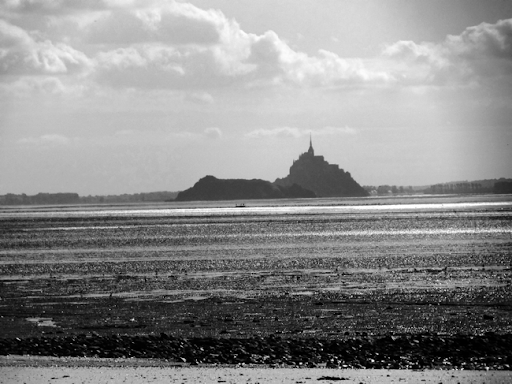 The village overlooks the huge expanse of shallow water surrounded by sand dunes and salt marshes, with Mont St Michel clearly visible in the distance. 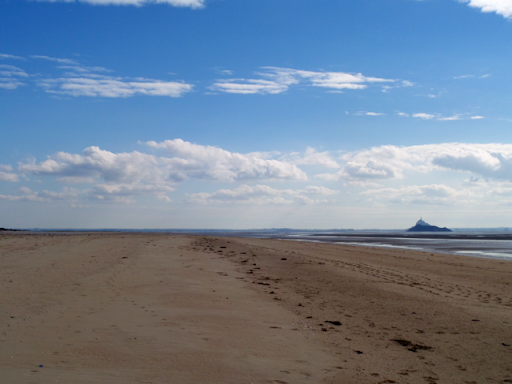 It was very still and sunny, so once set up we walked through the campsite and on to the beach. The tide was out, revealing a huge expanse of sands, some of which was quicksand, plus ribbons of dark clay. 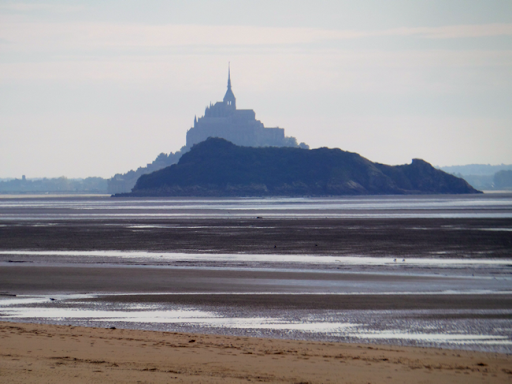 We walked barefoot for about two miles, towards Mont St Michel, then returned via the dunes and the beach. It was very quiet and peaceful and we pretty much had the beach to ourselves, although Cathy said she wished her glasses were a stronger prescription when I pointed out the man walking naked further down towards the sea! Back at the van, we sat out in the strong sunshine with a cup of tea. Cathy gave the van a good 'uck-out' and we both showered (not together - there isn't room! 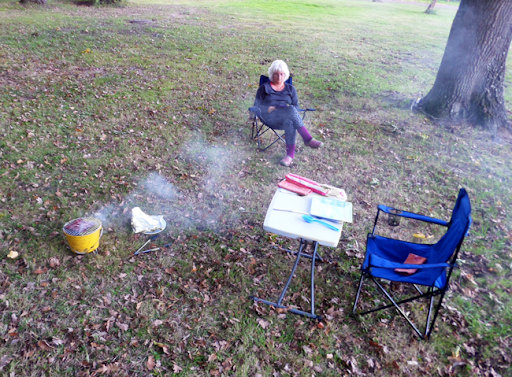 ); we were a bit smoky (some would say well preserved) after our impromptu wood fire last night! We were both hungry and the plan was to walk into the village to get something to eat - surely somewhere would be open - how wrong we were! Every restaurant, bistro and cafe was closed. The hotel with its restaurant and bistro would normally have been open, but they'd closed for this week only to go on holiday. On our empty-stomached walk back to the van we discussed what we could eat. In the end I concocted a meal of chickpea dahl (from a tin someone left in the van) and cooked rice which I fried with shallots, garlic, chorizo and some egg - very strange but filling all the same. Still, there's a Boulangerie in the village so at least we'll be OK for breakfast. It was very, very windy last night - all outside. Apart from the wind waking me occasionally I slept well, although Cathy didn't. It was a still, clear morning though and I was up by about 0830, shaved, showered and out to get breakfast. I could hear the children playing in the école across the road and the bridge was quite busy - must be Monday morning commuter traffic! I walked into the village and bought a Bluette, the equivalent of a banette here, a croissant and two small pear tarts. Across the road was the bar/tabac, so I walked in, offered a "Bonjour" to all inside and ordered un café. The TV was on and I caught the weather forecast - not bad in our area but bad floods in the south east of the country. Coffee paid for, I walked back to the get the kettle on and prepare breakfast. 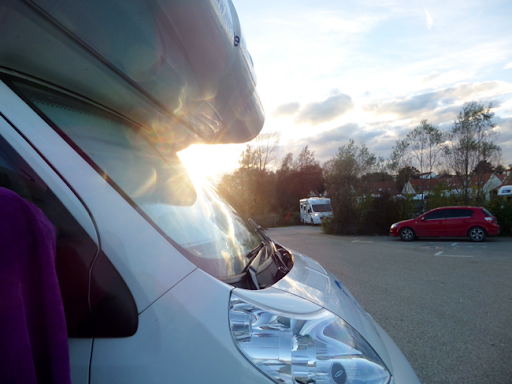 We opened the blinds, skylight and windows to let some fresh air and sunlight in to the van. All done, Cathy did some washing while I disconnected and stowed the EHU cable and dropped the vans off the levellers. Once all secured we drove over to the exit, Cathy punched in the code and we drove under the raised barrier and over to the service point. We planned to drop waste and take on fresh water - two out of three wasn't bad I suppose. Our fresh water jinx hit us again as the pressure was too low to make it through the hose pipe - if only we had a water container and funnel! So we headed off to our next stop, the riverside town of Saumur. We found some parking about 5 minutes walk from the town centre and adjacent to the School of Cavalry. Saumur is the HQ of the French equivalent of the Royal Armoured Corps and Household Cavalry. It was lunchtime so most of the shops were shut; even some of the restaurants were shut! 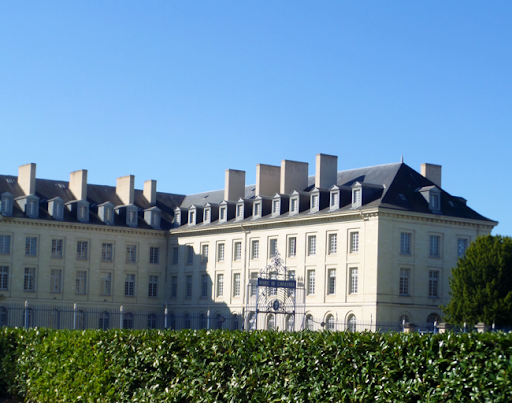 We walked up the hill to take a look at the view from the walls of the chateau, but there wasn't much to tempt us to stay in town. 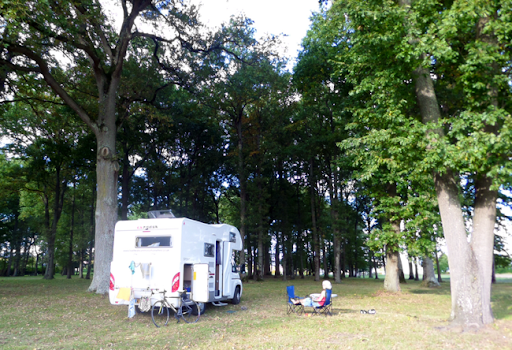 Our original plan was to use an Aire just outside the walled medieval town of Richelieu, but now all 'towned' out, I looked for a quiet, peaceful alternative - I'm so glad we changed our minds. 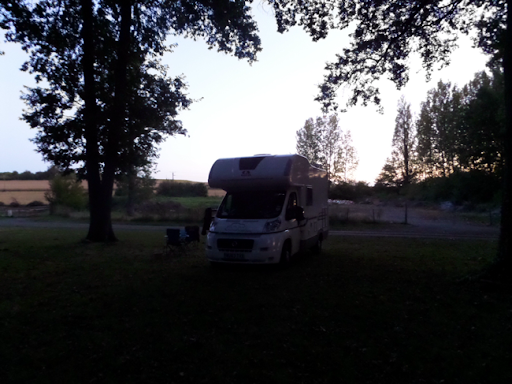 We ended up at an Aire de Service on the outskirts of the village of Le Coudray Macouard. 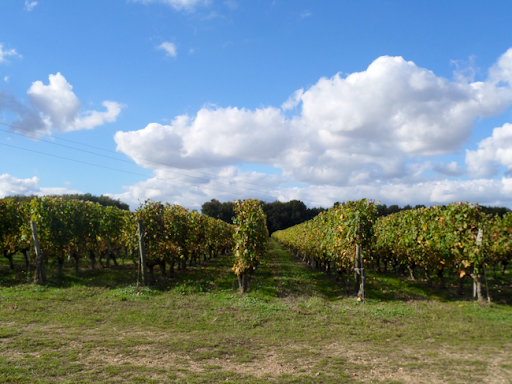 This is deep wine country and the Aire is in an isolated oak tree glade, surrounded by fields of maze and vineyards. It is so quiet. 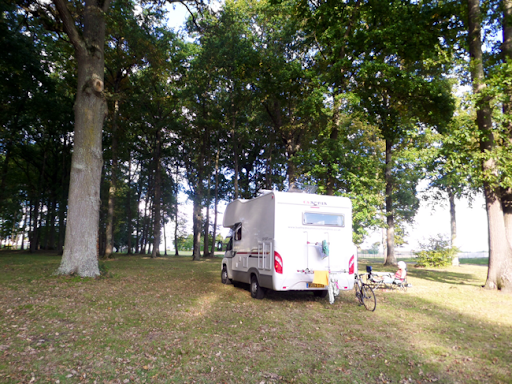 We were the only ones here and we parked on the grass, under the huge oak trees, but still in hot, bright sunshine. Cathy sat in her chair to read and I took a walk a walk into the village looking for a shop, but only found a bar, hairdressers (open) and a butchers (shut). But in the walk back to the van I found some rosemary to throw on the charcoal to flavour our Bavette steaks and also loads of ripe walnuts. Back at the van, I decided to combine victuals hunting with exercise, so prepared my road bike, changed, grabbed the rucksack and headed off towards the next village called Bron. I rode past vineyards and fields of ripe maize. 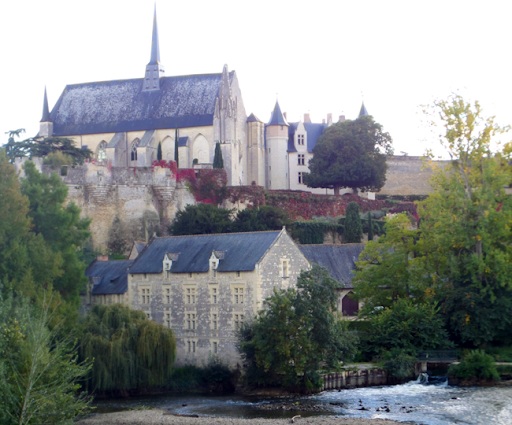 Bron was a small hamlet with no shop, so I continued on to the next town, which also has an Aire - Montreuil Bellay. I stopped at the river bridge to take some photos and eventually found a large Super U. I'd forgotten to take my bike lock, so I quickly skidded around in my cycling cleats collecting some bread, butter, tomatoes, shallots, water and wine. The red wine, I discovered when I opened it back at the van, came from a small producer in the town I bought it from, bought in a large supermarket in the same town. Thankfully my bike was still in the rack and I enjoyed a fast ride back on empty country roads, albeit with a heavy rucksack. On my return I prepared dinner, sampling the red wine which was smooth and delicious. 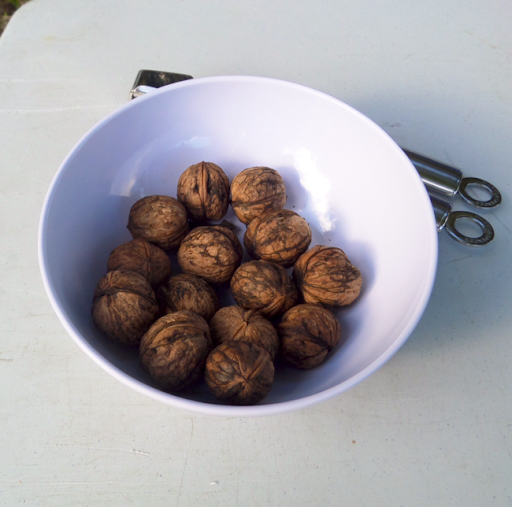 Cathy had cracked the walnuts so we had a small bowl of fresh, oily, tasty nuts. I used these to make a salad, with mixed leaves, fried lardons and goats cheese. I also made a sauce with the shallots, butter, garlic and a splash of white wine. The steaks had been marinating in a little oil and rosemary and I threw the remaining sprigs on the BBQ so the smoke infused its flavour into the meat, which only took minutes to cook. We enjoyed this with a glass of wine and some bread, before leaving the washing up and heading out for a walk around the fields as the sun set in a clear, cloudless sky. It was lovely, quiet and peaceful. Back at the van Cathy washed up while I coaxed the BBQ back in to life with some dried oak twigs and small branches. It smoked for a while (we now both smell like a bonfire!) but the flames were soon up and we sat in the dark with a cup of tea, watching the flames and listening to the owls and frogs. We were next to a sewage works, which sounds dreadful, but it was an eco-friendly reed bed style so attracted the frogs to the ponds. It's now just past 2100 and we're back in the van. The quiet outside is deafening, the night is very still and I hope we both sleep well. We'll decide on where to next to tomorrow, but I suspect we'll make an early start and sprint for the coast again - we miss it too much!